Based on the frankly incredible true story, Lion is a masterpiece in cinematic storytelling, emotionally complex yet narratively modest. Four year old Saroo is separated from his brother and finds himself lost amongst the millions in Kolkata. When an orphanage fails to deduct his town of origin, he’s adopted out to a family in Tasmania, where he starts a very different life. Years later, he becomes obsessed with returning to his family, but the name of his home town doesn’t appear on any maps. So begins an obsession that will threaten to tear his life apart. Lion is a story without a clear antagonist. In fact, Saroo is his own antagonist. Simple without being simplistic, the story presents us with no villains; the drama here is about people killing each other with kindness. 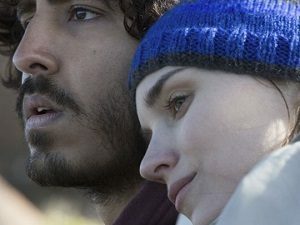 Adult Saroo (Dev Patel) is terrified of letting his adoptive parents (Nicole Kidman and David Wenham) know about his search, lest they think him ungrateful. His girlfriend, Lucy (Rooney Mara) wants to be supportive but can’t get sucked into his single-minded obsession and self-pity. Meanwhile, Saroo’s parents are having difficulties with their second adopted son, Mantosh (Divian Ladwa) whose struggles with alcoholism and post-traumatic stress present their own issues. The film starts out slowly, and spends a lot more time with young Saroo than I expected. It frustrated me at the time, but it was totally worth it for the emotional payoff that is the third act. Patel’s Aussie accent is brilliant. I completely forgot that it wasn’t his native accent. He’s proven more than once that he can carry a film, and it’s no different here. He is focussed and driven, yet never so single-minded as to get the audience offside. Mara (another actress is who is excellent no matter how poor the film) is so good in a supporting role that I was desperate to see more of her. Kidman and Wenham are solid also, but this is really Mara and Patel’s film. The narrative dynamics in this film are stunning. We are frequently subjected to ten minute blocks of drama without a single spoken line, whilst other scenes crackle with sharply written dialogue. At 118 minutes it isn’t an overlong film, but it is emotionally exhausting in a life-affirming way. A fantastic beginning to 2017, Lion is a must-see Australian film. This entry was posted in Film Reviews and tagged Biopic, Drama by Stuart Wilson. Bookmark the permalink.